Unveiling of 2-acre expansion with brand new wing for leisure travellers. Thailand was ranked ninth among the world's most-visited countries by the UN's World Tourism Organization report published in 2017. Foreign tourists who visited Thailand were from East Asian countries, followed by Europe, South Asia and the U.S. compared to the same period of the previous year, the number increased by 15.51%, generating more than 190 billion THB with an increase of 21.03%. A survey of Thai tourism found that 57% of foreign tourist respondents repeated their travel to Thailand and 53% planned their trip to Thailand only. Enjoy a weekend getaway from SGD 188++ inclusive of breakfast for two from now until March 2019. For reservations, please email h9649-RE@sofitel.com or call +66 32 709 555 to book. 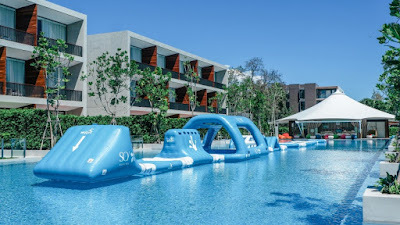 Visit www.so-sofitel-huahin.com for more information. SO/ Hotels & Resorts is so vivid, expressive and bursting with local energy that even the most adventurous travelers will be fascinated and entertained. A dynamic player on the global hotel scene, the SO/ brand surprises with a playful and distinctly rebellious interpretation of luxury that includes avant-garde design, a passion for fashion, trendy beats, ‘Just Say SO’ service, and buzzing destination bars and events. Originally created as an exclusive label of Sofitel, the SO/ brand can now be found in socially vibrant destinations such as Berlin, Mauritius, Bangkok, Saint-Pétersbourg and Singapore. SO/ hotels are places to be and to be seen, thrilling guests with fashionable and entertaining social experiences that capture the vivacity and vibe of the locale. SO/ Hotels & Resorts is part of AccorHotels, a world-leading travel and lifestyle group which invites travelers to feel welcome at more than 4,500 hotels, resorts and residences, along with some 10,000 of the finest private homes around the globe.